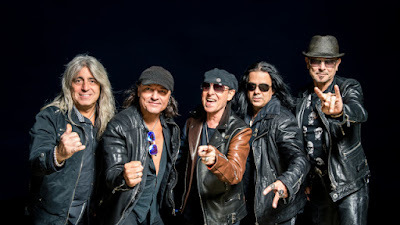 The Scorpions have cancelled the remaining five dates of their North American tour after singer Klaus Meine was diagnosed with a case of severe laryngitis. The affected dates – featuring guests Megadeth – includes shows scheduled over the next week in Phoenix, AZ , San Antonio, TX, Dallas, TX, Fort Lauderdale, FL and Tampa, FL. Ticket refunds for the cancelled concerts can be made at the point of purchase. The tour news follows word that The Scorpions had cancelled plans to appear at an October 6 Los Angeles City Council presentation honoring the group “due to illness in the band”, according to Councilman Jose Huizar. The Scorpions did manage to perform an October 7 date at The Forum in Los Angeles, CA prior to shutting down the North American trek. The group are next scheduled to begin a European tour with the first of seven Russian dates in Sochi on October 28.